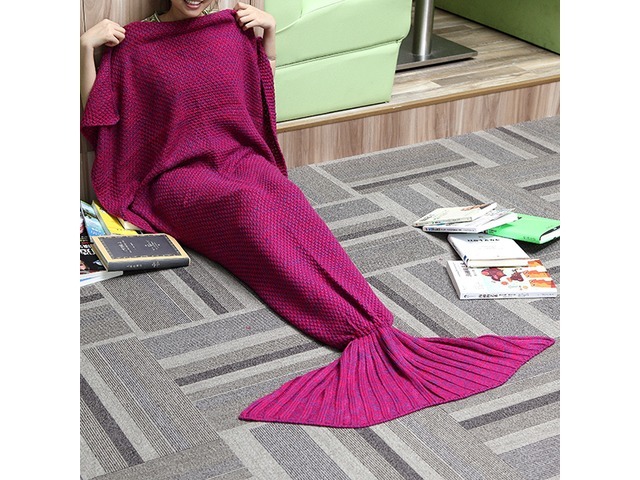 180x90CM Yarn Knitting Mermaid Tail Blanket Cashmese-like Warm Super Soft Sleep Bag Bed Mat The blanket uses half-length design that your feet can go inside of the tail. 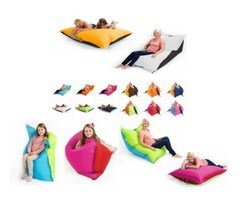 It is made with soft acrylic fibers that can keep you warm at leisure time. It is for summer also when you are in the air condition room. Perfect blanket for a day in with hot coffee/milky tea and movies or to cuddle up with a book. 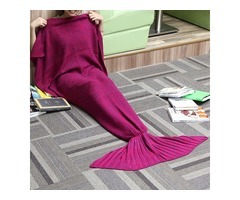 Specification: Fabric materials: Cashmese-like Size: 90x180cm Weight: 630g Color: Rose, grey, purple, red, pink, lake blue Washing mode: hand wash, dry clean Application: sleepovers, camping,lounging, long car trips Package Contents: 1 x Mermaid Tail Blanket Warm Note: - The length of blanket includes tail length. - The blanket is knitting, please wash separately, hand wash with warm water or dry clean only, no machine wash.